Note: This is another repost from my MattTheWebguy blog. It kinda explains my "condition". Hope you enjoy it! After a weekend of holiday prep, cooking and baking (and a few days of a nasty tension headache), I hung up the apron for an enjoyable Christmas Day with Regina and Boomper, the Boy Wonder. But after making "Southern" Russian Teacakes, a crock pot full of three-bean chili, a pot of Greens 'n Beans soup, a pot of Chicken Soup with Orzo, Chocolate AND Chocolate-Peanut Butter Truffles, a huge gingerbread cookie boy, and two other doughs that I just ran out of time to bake (but will be a nice treat next month), the day off of cooking left me with a bit of cook's withdrawal. 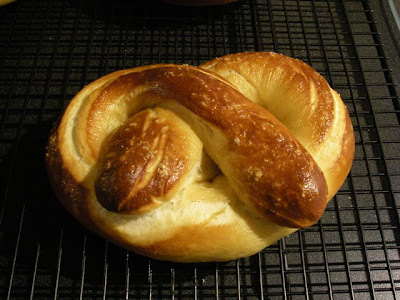 I soon set forth to track down the recipe I remembered from the "Pretzel Logic" episode of Alton Brown's Good Eats on Food Network. With printed page in hand, I presented my idea to Regina, and then headed to the kitchen to make sure I had everything I needed. We decided to have them with dinner, so I had some time to plan and prep. A few hours before dinner, I started the dough. I gave up on 'active dry' yeast a long time ago in favor of instant yeast. I like the instant yeast because when I'm making pizza dough, or baking bread in the bread machine, it can be added to the dry ingredients. No proofing necessary. This recipe called for for proofing the active dry yeast in lukewarm (who WAS Luke, and why was he always so-so warm?!? ), salt and sugar, so I decided to proof the instant yeast. I swear I could hear the little yeasties burpin' and tootin' (well, that's what they do). Soon the yeast was nice and foamy, and ready for the flour and melted butter. After a thorough mixing, kneading and a one-hour rise, the dough was ready to be portioned, rolled, and pretzeled. Now comes the science. 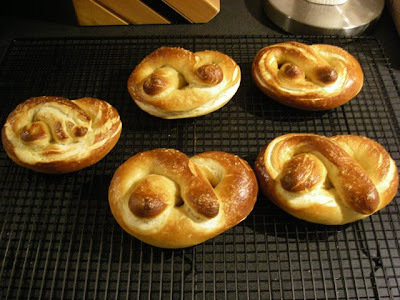 Prior to baking, each pretzel took a 30-second dip in pan of boiling water-baking soda solution. Dipping each pretzel in this slightly "basic" solution, helps the pretzel brown to a deeper mahoghany finish, helping the pretzel look more like a pretzel, and less like a funky-shaped dinner roll. Each pretzel then got a quick brushing of eggwash, and a sprinkle of Kosher salt, and then into the oven. Yes, pretzel salt is ideal, but I wasn't planning on heading to the grocery store just for it. Maybe on my next trip. The picture above is all that is needed to tell of the end result. That, and the "yummy" I got from Boomper. That one makes it all worthwhile.